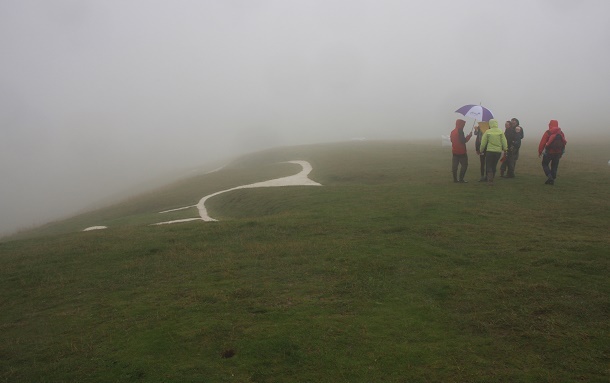 Rain and fog are not the best conditions to climb up to the Uffington White Horse, but they are rather typical weather conditions for English August Bank Holidays. This was the view I got yesterday. But although visibility wasn't exactly great I'm still glad I made the effort. I also walked around Uffington Castle, which is an Iron Age earthworks, and on to Dragon Hill. Today I am intending to visit Wayland Smithy, a couple of miles from the Uffington White Horse. Although the weather has been a bit grim, I've been staying at a very welcoming pub nearby, called the Fox and Hounds. As well as offering views of the White Horse from the garden, it serves a really good Sunday lunch and this weekend has a beer festival on. Just the place to warm up and spend the evening.